Famous food blogger Jeff Phillips cooks almost everything in a smoker, and in his critically acclaimed cookbook, Smoking Meat, he creates an incredible breakfast recipe. 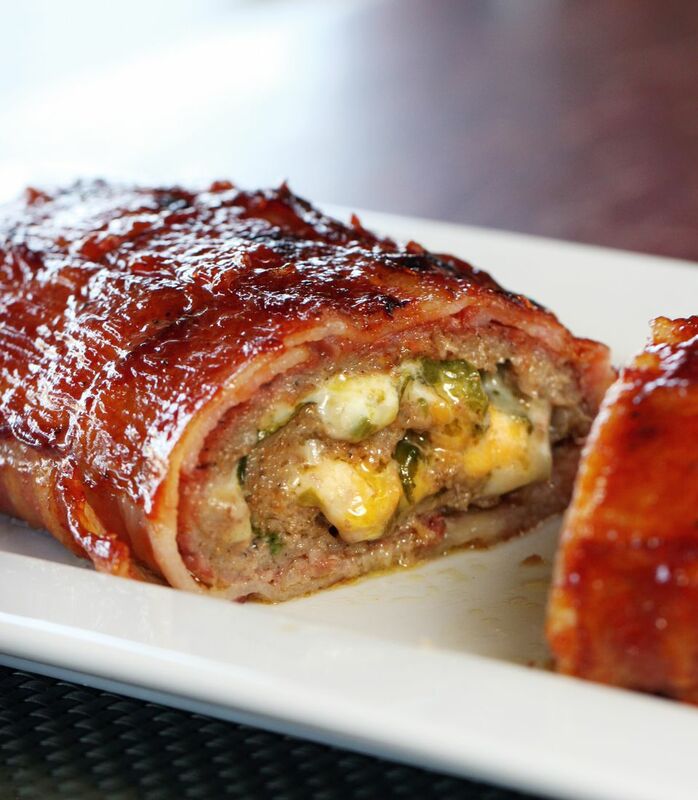 The "fatty" is breakfast sausage rolled with pepper Jack, jalapeno, and spinach, then wrapped in a woven exterior of bacon. This delicious concoction is smoked at a low temperature, but you could also try it in a low-heated oven. Serve the "fatty" with eggs or put a slice on top of a burger. Reprinted from Smoking Meat by Jeff Phillips, photography by Michelle Furbacher, Whitecap Books © 2012 with permission of the publisher. Lay seven strips of the bacon in a horizontal fashion on an 18x18-inch piece of waxed paper. Remove strips two, four, and six. Lay a single strip of bacon along the edge, across rows one, three, five, and seven. This is column one. Replace rows two, four, and six on top of column one. Fold back rows one, three, five, and seven, and lay the second column of bacon right beside the column one and across rows two, four, and six. Replace rows one, three, five, and seven across column two. Continue this pattern of weaving until you have completed a seven-by-six bacon weave. Place the sausage into a 1-gallon Ziploc bag. Zip the top of the bag, then snip a bit off of the two bottom corners to let air escape. Using a rolling pin, flatten the sausage evenly so you have a perfectly formed square. Use a sharp knife or scissors to cut the bag, leaving the sausage square on the bottom. Flip the sausage square onto an 18x18-inch piece of waxed paper. Remove the plastic. Layer the top of the sausage with the pepper Jack, jalapeno, cheddar, and spinach leaves. Roll the sausage up, with the filling inside, using the waxed paper as a guide. Once the sausage is completely rolled up, place the roll along the bottom row of the bacon weave, centering it. Use the waxed paper that the bacon weave is lying on to help you roll the bacon around the stuffed sausage roll. Leave the fatty on the counter while you set up your smoker. Prepare your smoker for cooking at 225 F to 240 F. If you are using a gas, electric or a charcoal smoker, be sure to have enough wood chips (hickory, cherry, or pecan) or chunks to produce smoke for about two hours. Once the smoker is ready, carefully place the fatty directly on the smoker grate with the seam of the bacon weave facing down. Smoke the fatty for three hours. Once it is done cooking, remove it from the smoker grate and let it rest for 15 minutes before slicing it into 1/2-inch medallions. Serve the fatty slices with eggs or on a burger or sandwich. Fatties even taste great on a plain piece of bread with a little barbecue sauce drizzled over the top.